We generally teach the PADI Open Water course each month. The course is broken down into three sections, academics, confined and open water. 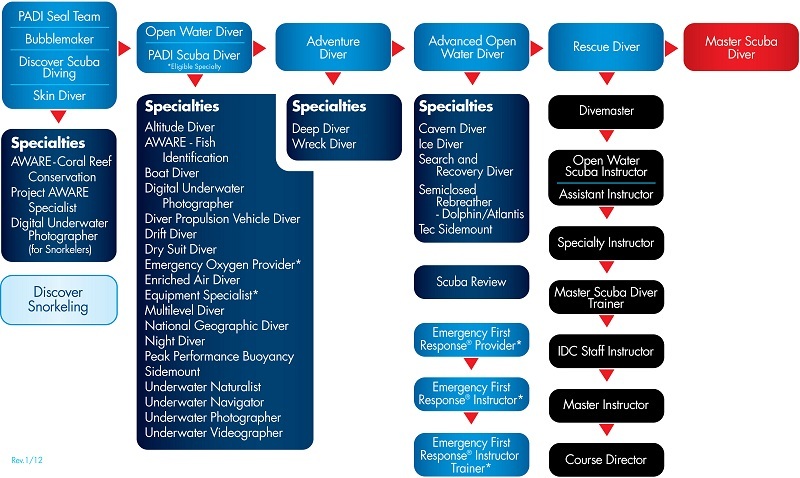 In the confined section you will develop the skills needed to become a safe and proficient diver in a pool setting. This is done at 1000 Spring Resort near Hagerman, usually on Saturday and Sunday mornings. The academics portion of the course may be conducted in one of two ways. First you can learn in a classroom environment which is generally held on Friday night and Saturday afternoons, just prior to your confined pool sessions. The second way to complete your academics is online through PADI e-Learning. The next weekend, its off to open water to fine tune your skills. We go to various places depending on the weather conditions. Normally during the summer months open water is held at Dierkes Lake. In the winter we travel to warmer waters, either Blue Lake near Wendover, Nevada or The Homestead Crater in Midway, Utah. After your Open Water course, it is always recommended that you continue your training in order to get the most out of the wonderful sport of scuba diving. We can help you with all courses that may interest you. Please contact us today and lets guide you to the next adventure.